We're all really bad at not appreciating the things that are on our own doorstep. Ardoe House Hotel on the outskirts of Aberdeen is a place I've been on a number of occasions but pretty much always for functions or corporate events. As such I've never stayed in the hotel or made the most of their dining offering. 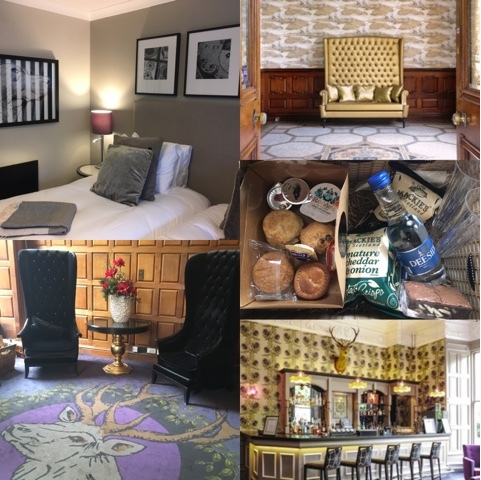 To give it its full title, Mercure Aberdeen Ardoe House Hotel and Spa, is a beautiful 4-star 19th century mansion house set in 30 acres of tranquil Aberdeenshire countryside. It boasts 120 bedrooms and is situated just 3 miles outside the Granite City thus providing the perfect backdrop for a relaxing weekend. 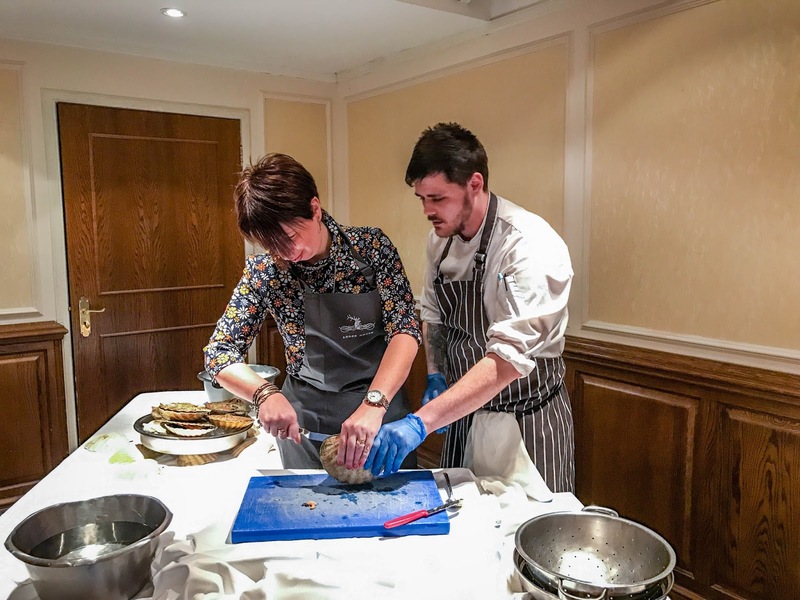 As such I was delighted to be invited to kick start my February with a culinary masterclass and overnight stay. My BFF was equally delighted to be asked to attend as my plus one but expressed reservations as to how hands on the masterclass might be. I was assured that it was just a demo so you can imagine her horror when she spotted aprons on the chairs! On arrival at Ardoe we checked into our spacious twin room which was stylishly furnished with super comfy beds plus a seating and work desk area. The large bathroom had a walk-in shower and was kitted out with toiletries, robes and slippers. Complimentary soft drinks and snacks awaited alongside a Nespresso machine and an #ArdoeMasterclass Picnic Hamper was delivered containing a selection of scones with cream and jam, scotch egg, pork pie, chocolate brownies, local crisps and sparkling mineral water. Time to head down to the Masterclass and meet up with fellow bloggers John of The Everyday Man, Claire of Bee Waits and Alex & Ziggy of Scotland Travelaholic. Leading the Masterclass was Ardoe's Executive Head Chef Richard Yearnshire assisted by Senior Sous Chef Alan Clarke and Pastry Chef Daniel Grant. Time to don our aprons and roll up our sleeves! The menu and recipes for the Masterclass had already been delivered to our room along with our Hamper and details of the event timings. The first instruction was 'the preparation of the pork belly needs to be cooked in advance over a three day period'. Luckily Richard explained that for a number of elements they would be working on a 'here's one we made earlier basis'. Phew, not sure we could have waited 3 days for our dinner. Richard took great pains to explain the ethos of the fine dining offering at Ardoe's Blair's Restaurant. As much as possible of the food is local with an emphasis on quality and provenance. A myriad of textures, flavours, temperatures and cooking techniques are used to prevent palate fatigue. 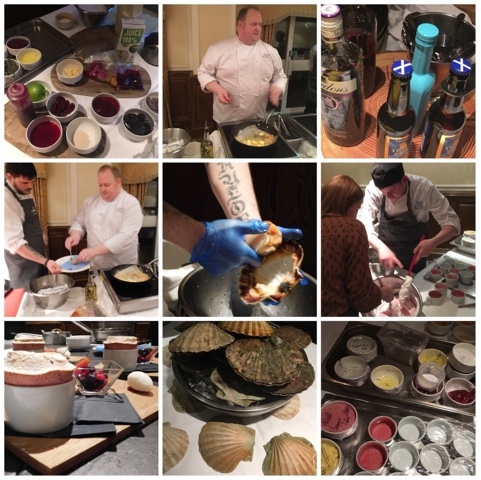 We were wowed with techniques using brining, sous vide, salt baking, dehydrating, pané, vac packing, gels, jus, syrups and souffles. Thanks to Ziggy at Scotland Travelaholic for the above couple of photos. I made a complete pigs ear at my attempt to shuck a humongous Isle of Skye Scallop. When it came to plating up we were again offered the chance to try our hand, I stepped back for this opportunity fearing another faux pas. However when it came to whipping up the souffle my BFF stepped forward and folded in the egg whites and cranachan base like a true pro. By this time our mouths were watering as we'd watched the first two courses being prepared, cooked and plated up but hadn't eaten a thing. The cooking smells were tantalising and when the souffle arrived from the oven we all grabbed a spoon and dug in. It would only have flopped and the sorbet melted if we hadn't. 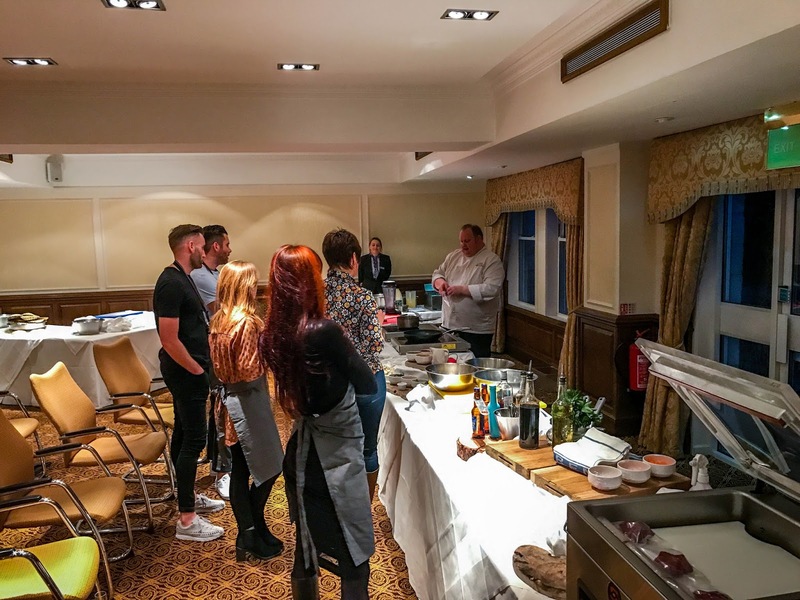 A quick change of clothes to dress for dinner and at last with rumbling bellies and eager anticipation we headed to Blair's Restaurant to enjoy our Mercure Masterclass Meal. As expected everything tasted absolutely wonderful and all eight of us agreed that we enjoyed our meal even more having seen all the time, skill, techniques and sheer passion that had gone into creating it. Bar the scallops, pork and venison my personal favourite elements were the pork crackling ring, the Sloe Gin jus (surprise surprise!) and the onion tarte tatin. 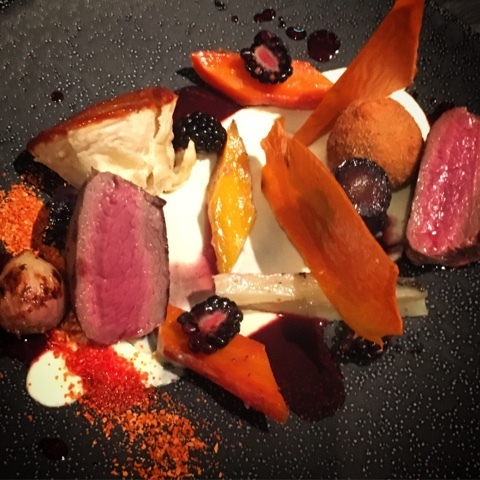 A sensational journey for the palate which truly captured the farm to fork ethos. 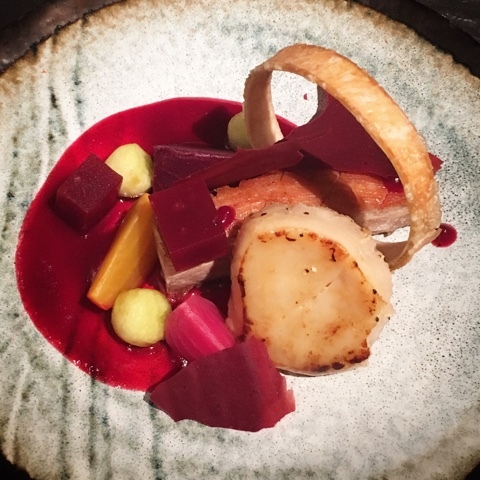 Hand Dived Scallops, Pork Belly, Beetroot Flavours. Loin of 24hr Braised Shoulder of Venison, Onion Tart Tatin, Salt Baked Vegetables, Blackberry and Sloe Gin Jus. We enjoyed a post dinner drink in the Lairds Bar before retiring for the night. 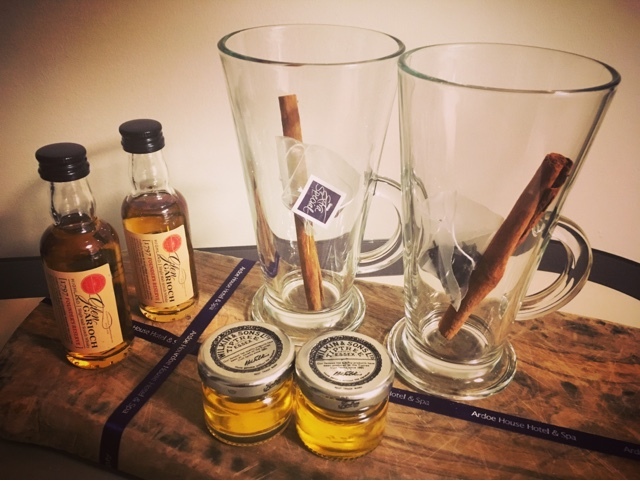 However upon entering our room we were met with a further treat to enable us to create our own Hot Toddies as a nightcap. It would have been rude not to partake! A hearty cooked breakfast was the order of the day to start Sunday morning before heading to the Spa for a swim, steam and sauna. The perfect end to a relaxing and educational #experiencemercure weekend break. Disclosure: This is a commissioned post for Mercure Hotels. 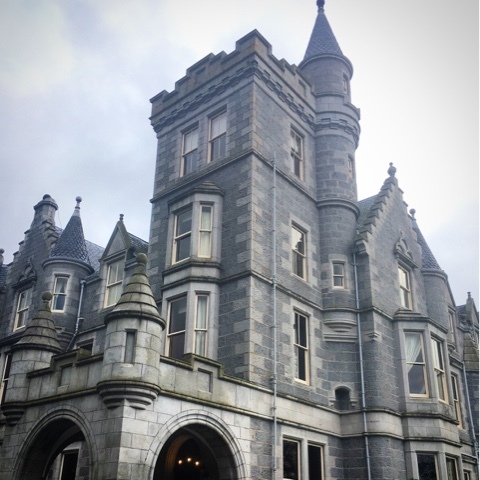 We ate and stayed as guests of Mercure Aberdeen Ardoe House Hotel and Spa. All views expressed are my own. Thank you for supporting the brands who make it possible for me to continue to share my Edible Scottish Adventures with you. I’m super choosy and promise to bring you only the cream of the crop. I much prefer classes where you are hands on as I think you take the learning on board more thoroughly that way! The hotel itself looks really beautiful and their menu is very appealing! I agree with you Kavey and despite her reservations my culinary challenged friend got well and truly stuck in. Oh wow this looks incredible. Can you believe I've never visited Scotland? Could be persuaded for this hotel. Oh do come! I can show you all the best places and we have REALLY good food. What a lovely warm-looking hotel, I've never been to Scotland, but whenever I'll be able to visit, I would love to stay in a beautiful hotel like this one. 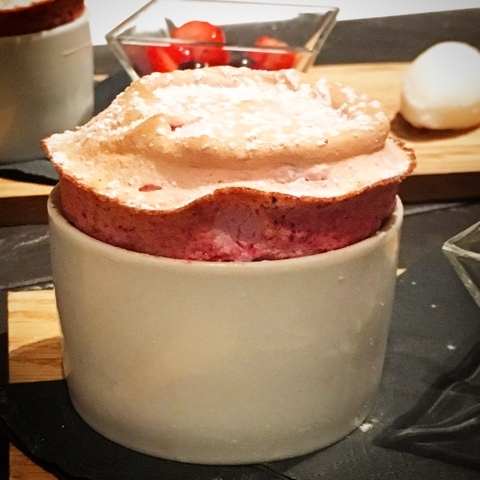 I'm drooling all over your masterclass pictures, I bet that souffle tasted amazing! We have some absolutely lovely Castles and Stately Homes in Scotland that have become hotels - all serving up fantastic Scottish food and hospitality - you would be made most welcome. I'm really not a dessert person but the Souffle was delish.